Transparent headers are very popular in web page design. The header "transparency" means that the page content area is merged up into the header, and the background image or video of the content row becomes the background of the header, as shown in the following screenshot. 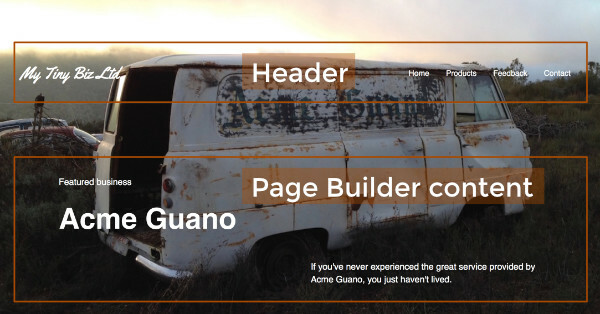 Create a row with a background image or video in Page Builder and add content. Move the content area to the top of the page and the header down. Note: If you don't have content in this row, then you can simply set up a regular header in Beaver Builder Theme and use a background image in the Header style section. Create a header in Beaver Builder Theme, such as in the following screenshot. Note: If you set a background color, don't enable the background gradient. The header transparency will be controlled by the CSS, so this version of the header with a background color is what will display on any pages to which the transparent header doesn't apply. If you don't yet have your content row set up, follow these steps. Open a page in Page Builder and create a row. Add a background photo or video to the row. On the Advanced tab, change top row padding to a number of pixels that will create room for the header. You'll probably need to tweak this number later. In the example here, it's 300px. Test and adjust after superimposing the header onto the content area in the next procedure. Add the content you want to the row. Tip: If you plan to apply a transparent header to every page, you might want to save this row, so you can easily add it to the new pages on your site and change the content as you like. The following code will apply these CSS rules to every page. See the tweaks in the next section for other options. Copy and paste the CSS below. Refer to the article on where to put CSS code. In the .fl-page-header rule, change the top property to the number of pixels it takes to move the header down from the top of the page to the position you want. Remove the .border-bottom-style line if you want to keep the 1px border below the nav area. To make the transparent header apply to a page other than the home page, find the ID of the page by mousing over the page in the admin panel and viewing the ID number in the browser status bar, as shown in the following screenshot. If the ID is 73, as in this example, then replace the .home selector with .page-id-73 in the first line of the two CSS rules, as follows. The CSS rules in the previous procedure apply to all device sizes. To make the transparent header apply only to large devices only, wrap the two CSS rules in an @media rule, as shown in the following code. To apply the rules to both medium and large devices, set min-width to 768 px). If you have set a custom medium device breakpoint in Page Builder Tools > Global Settings, change the min-width value in these rules to match your custom value.